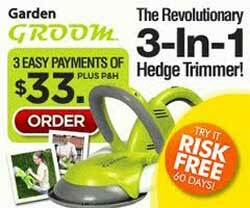 Garden Groom is an electric hedge clipper that clips, collects and even shreds hedge clippings. It is light-weight, ultra easy to transport and absolutely perfect for people who love to give their yard areas a professional quality design but who aren’t comfortable working with heavy and often dangerous tools. This product is safer than any of the alternatives in hedge trimming. There are absolutely no exposed blades on the unit, meaning that there is a very minimal chance for injury. It is also the ideal tool for mulching. The Garden Groom is even perfect for individuals who no are no longer able to exert an extensive amount of energy into their yard work. While changes in health and mobility often make it difficult for dedicated gardeners to enjoy their favorite hobbies, innovative tools such as this one make it possible to obtain the same results without having to labor to get them. How Does Garden Groom Work? The Garden Groom is powered by a 500 watt electric motor. This rotates a concealed blade that is able to cut through branches of up to 0.6 inches in diameter. These branches are then shredded and all resulting debris is efficiently collected. Once the collected waste has been shredded and reduced to a 10:1 waste ratio and then deposited into the collection bag or collection unit depending on the Garden Groom model that is being used. It is always important to look for reviews that cover the various Garden Groom features that help to make the product unique. Reviews that contain this information tend to be generated by quality-conscious, trustworthy sources. The Garden Groom series, including the Garden Groom Pro, offers consumers a variety of convenient features. Able to cut branches of diameters up to 0.6 inches.